The Fourth Time’s The Charm, You Know, And Now Everything Is Different. When we first met Owen Provenzano, we had no idea what we were in for. 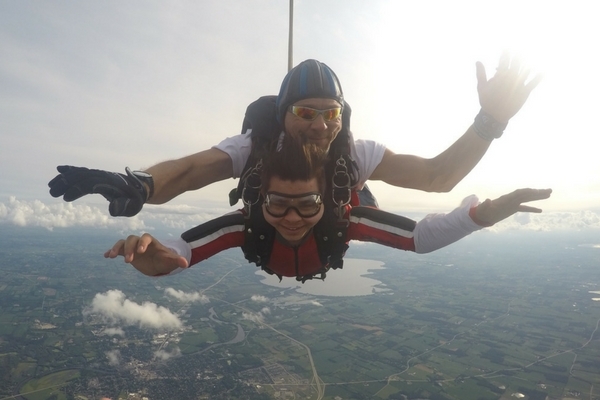 This amazing guy is proof positive that not only is it possible to get over a crippling fear of skydiving, but that doing so might be the best thing you can possibly do to improve your life, your outlook and your prospects. 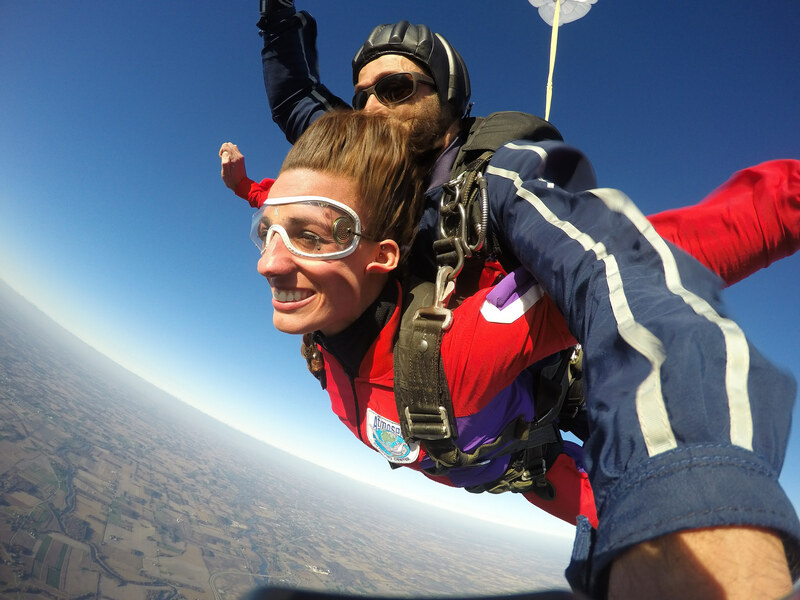 Here’s the brief: After refusing to get out of the plane as a tandem student on three separate occasions, Owen just knocked it out of the park and became a solo skydiver. We couldn’t be prouder of Owen and his accomplishments. Here’s Owen’s (amazing) story in his own words. 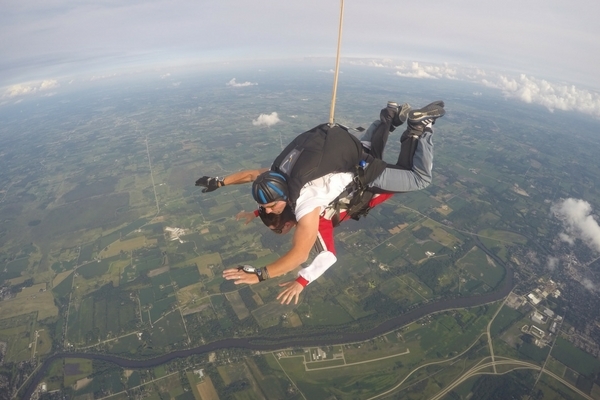 The first time skydiving crossed my mind it was about 3 or 4 in the morning. I was staying up late watching this movie called The Secret Life of Walter Mitty. The movie is about this guy who has a normal life. He goes to his job every day in an office and does everything right, but he is about to get fired anyway. His “secret life” is his daydream life; all the adventures he goes on in his own head. The movie made me think about the fact that I was not really doing anything with my life. Up until that point, I really haven’t done anything that was excellent in my life. I had mostly spent time playing games on computers and editing videos. 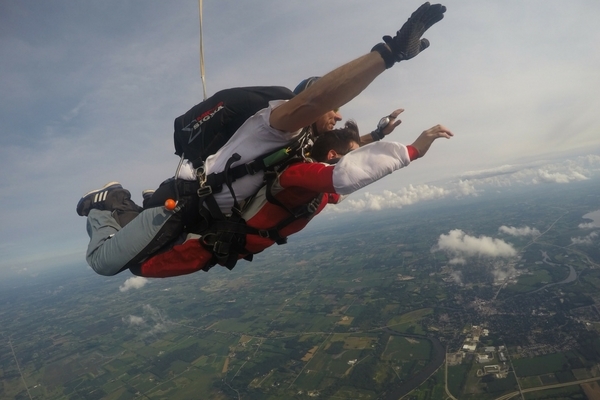 I realized at that moment that what I really wanted to do was go skydiving, so I signed up at four in the morning to go. I didn’t tell my mom or my dad because I knew if I told them I would talk myself out of it. I just signed up. I didn’t sleep the whole night; I got up an hour before and went for a skateboard ride to hopefully clear my mind because I was so scared. I got there and it was probably the most foreign place I have ever been. There were all these people I didn’t know. I went through the ground school, but I remember just standing there, scared out of my mind, but I was like–okay, I can do this. I suited up. 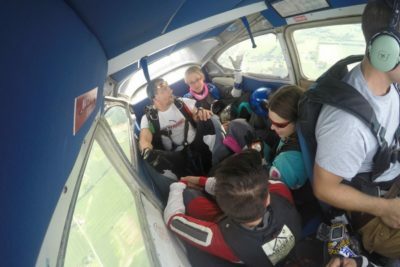 We went up in the plane. It is really high up. I don’t like being in small, claustrophobic places, really high off the ground. Then the door opened, and it was the loudest, scariest thing. So: Immediately, I was, like–nope, I need to go down. And we did. I felt pretty bad about it, but my instructor talked me through it. He reminded me that a lot of people don’t even get this far. 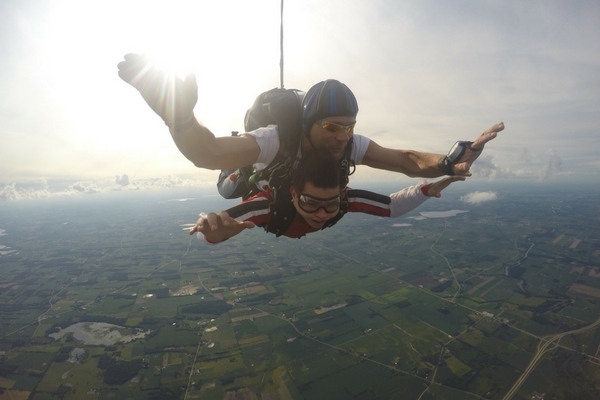 He reminded me that, even though I didn’t actually jump out, I did something that most people would never have done. I was embarrassed and I wanted to go home, but everyone encouraged me to stay. We’d been talking about video editing earlier, so they invited me to go back and sit with the editor to watch what he did. By the end of the day, I felt fine. I signed up to try again the next week. A week later, I showed up again. I listened to a bunch of inspirational speeches before I got there. The aborted jump the previous week had affected me a lot. I didn’t like the person that I saw in myself at that moment. Up until that point, I don’t think I felt that much fear and felt like I had failed that hard. Before, I just wanted to jump, but now, I felt like I needed to. I went back through all the training, got ready and got on the plane. Long story short, the door opened, I got my foot halfway out and then I just couldn’t lean out. I was just so scared, so I backed out of it again. I felt horrible landing. Sick, almost, but everybody asked me to stick around and not run off. I helped to edit videos again. I think that’s really part of the only reason I stayed is that I didn’t have to be there. That was so amazing to me–I didn’t have to jump to stay there. Everybody was still accepting of it and of me. So week three rolls around, and I’m going to go back up again. It felt like the last chance. Bo asked to be my instructor. Everyone thinks that if Bo can’t get me out of the plane, nobody can. I remember Bo talking to me that day, saying, “You have got to make sure that you are thinking in the present moment. You can’t be thinking in the future.” But the same thing happened again. I couldn’t do it. They shut the door and went around for a second try. He tried again, but he still couldn’t convince me to get out. We were landing with the plane, and Bo is like–hey, maybe this sport isn’t for you, but don’t worry. Even though you’re not jumping, that doesn’t mean you can’t hang out with us. He asked me to stay on as a video editor. He made it clear that he wanted me to be part of the community anyway. Later that day, one of the other instructors, Joe Hayden, came up to me. He said, “Let me take you out.” I was pretty hesitant. I really wanted to do it, but I didn’t want to fail again and go back up with that fear. But he convinced me. 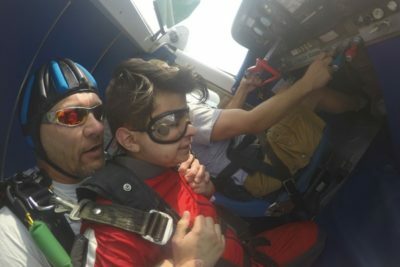 We were gearing up, and he said to me, “Just so you know: I don’t land with the plane.” I was terrified, but everyone in the hangar was giving me a pep talk on how to get out of the plane. I have never seen so many people working together to help me like that. We climbed into the plane, and he just said, “When that door opens, just look at me. Don’t look down. Don’t look at anything else. Just focus on me.” So we get up there, and the door opens. You can see in the video that I am totally checked out. Well, Joe just grabbed me in a big bear hug and there we went. It happened so fast. 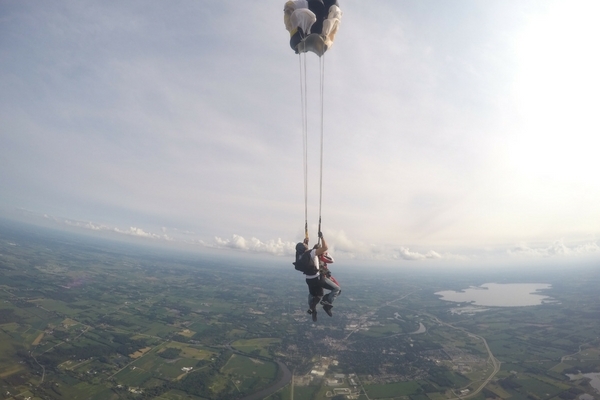 We had to do a barrel roll out of the plane because I was trying to grab onto anything I could get my hands on. It didn’t fully register until I was on my, belly falling. And then it hit me, all of a sudden–this is so amazing. When we landed, I was exhausted. I got so many high-fives. I felt so good. I signed up for AFF right away. I knew I still had a lot of emotional stuff to go through, but I was like, You know what? I will figure out. And I did. The big change happened during my sixth or seventh jump. The door opened, and I realized that I was actually excited to see it open. I enjoyed being in the plane. Now, when the door opens, everything else is out of my mind and I’m ready to go. It doesn’t even faze me anymore. 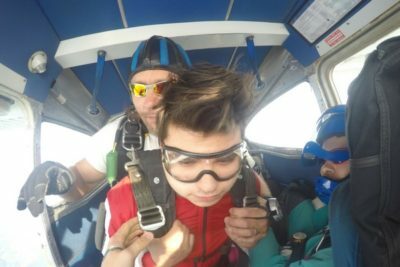 My advice to someone else who’s struggling with being really scared of skydiving is this: You’ve got to get out of your own head. You have got to be grateful for the experience. You have got to look around at the clouds and be, like: Wow. I am so glad to be up here on a Friday afternoon. I could be sitting in school and doing so many other things, but instead, I’m about to jump out of an airplane at 12,500 feet and feel amazing. A kid coming from a small town is usually doing one of two things: sitting on the computer or doing drugs. I had a long period where I struggled with that. It is funny how skydiving has changed my life and made me realize this is a third option–an escape from that cycle. 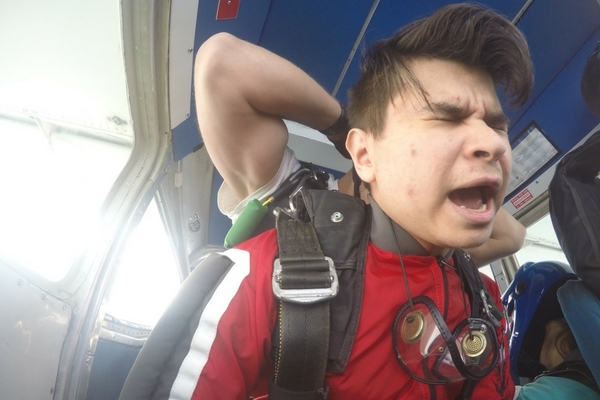 Before skydiving, before any of this, my hobby was computers. I built two of my own PCs and I spent a bunch of money on my computer setup. I was addicted to it. 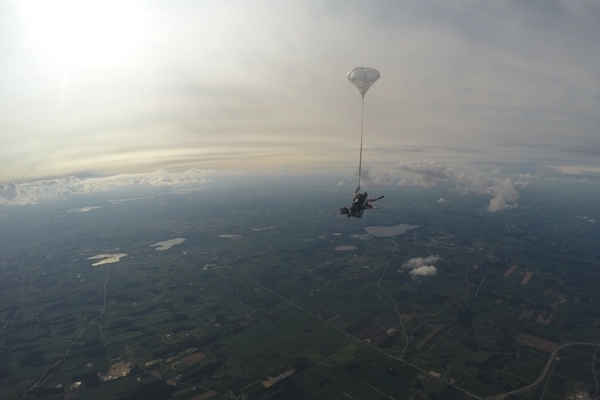 Now I am addicted to skydiving. That was a big transition–from sitting in a chair to jumping out of airplanes. I have made a lot of great friends here. I’ve always had friends online, but I have never really had a group of people that I would want to hang out with that aren’t forced to hang out with me because I’m at cross country practice or a team dinner or someplace else where everyone is required to be there. These people actually want to hang out with me. In the past, I had been under the shadow of someone else who was more successful, but here I am unique and praised and accepted totally. It is fun. I love it, but it is an odd experience for me. Getting past that fear is the best decision I ever made.